Yahoo! Site Builder is a free website building application that makes it easy to build sites and incorporate e-commerce tools into them. People who have zero programming experience can build sites within minutes using this tool. The site building tool is offered as part of the Yahoo product portfolio. It’s made for small businesses, but doesn’t skimp on any major feature. The tool is tailor-made for newbies and doesn’t expect its users to have any web design or technical background. The tool offers drag-and-drop functionality too, which makes getting started quite easy. With numerous customizable designs, mobile-friendly themes, web building tools, and many other site building options, the tool warrants the attention of techies too. Irrespective of the type of website you want built, this website building tool offers every feature to create a full-fledged website. Yahoo! Site Builder offers several flexible features that lets you launch and manage quality websites. For instance, you have the WYSIWYG page editor that lends to the simplistic framework of the tool. Then there is an application gallery that offers multiple quality applications for integration into your website. The tool lets you host sites on system servers, and the hosting infrastructure has built-in web building tools. As a result, you will not have to look for hosting providers elsewhere, which would save you effort, time and money. Small business users also benefit from corporate email IDs that will help boost credibility of their business. Yahoo! SiteBuilder for Windows makes it easy to design the website you want. With our new Site Creation Wizard and more than 380 templates, you have the power to quickly create a high-end site — and have it look like an expensive designer slaved over it for weeks. You can use standard word processing and drag-and-drop editing to build your web pages, so absolutely no programming knowledge is required! To be able to continue using the program as before. Be able to contact and get a response from Yahoo about this prob asap. Be charged half or less for having to troubleshoot all these issues which are'nt getting me anywhere until it is working again; I don't feel they care about satifying their long term loyal users. I don't know, but all I keep getting is error messges and not able to make changes, save or publish my account. 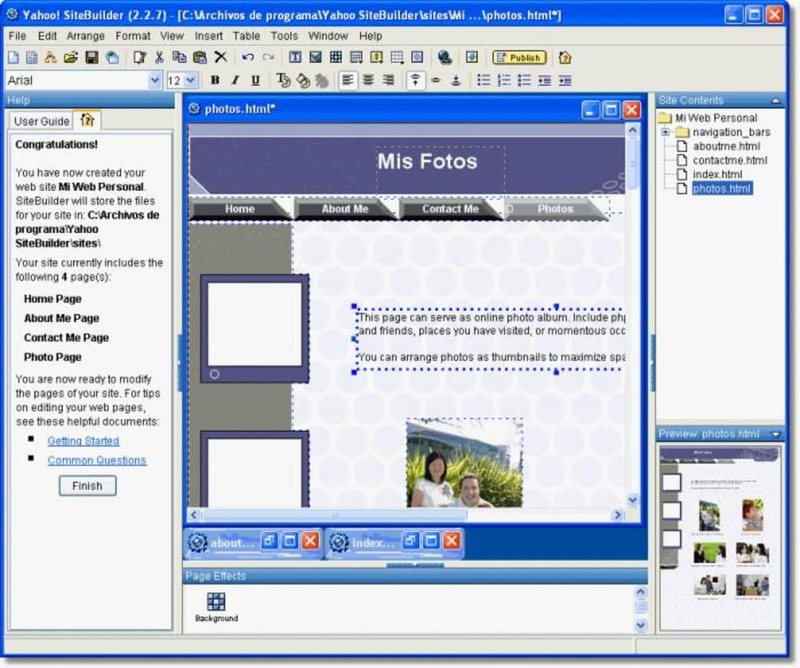 Yahoo sitebuilder. I love the Yahoo! SiteBuilder application but unfortunately since I switched to MAC, I cannot use it. Please create a Yahoo SiteBuilder application for MAC users..
but then I can't open a single one! WTH?!?? Can anyone help me with template downloads??? I have a site hosted through Yahoo and built by SiteBuilder. I have a site hosted through Yahoo and built by SiteBuilder. This was however, developed via a PC (Windows) and I now have a Mac. Is there anyway I can adjust my website using a Mac as most of the dialouges say that it's only Windows compatible? What do you think about Yahoo! SiteBuilder? Do you recommend it? Why?